I've never been a fan of this Autobot Jazz nonsense, yes, I know it's needed for legal reasons, but if you talk to someone about Transformers, they won't call him Autobot Jazz, they will call him Jazz. Please understand from this paragraph on, Autobot Jazz will be referred to solely as Jazz for the duration of this review. Thank You for your understanding and co-operation. Jazz is one of those older names in Transformers lore; it goes along with Ratchet, Prowl, Bumblebee. Before you knew it was a kind of music, you knew Jazz as a Transformer. He was the one who defined cool; the one so cool he was frosty but hip. He was sometimes Prime's right hand bot, and other times was the one who Prime had to tell to turn down the volume. If the Transformers civil war was to end tomorrow morning, Blaster and Jazz would set up some night club in New York City, and spend the rest of their days rock'n'rolling. Now like a lot of other bots from the 1980s, Jazz has seen his name coming up again in the rotation. He has his disappointing appearance in Bayverse, where he killed after saying maybe 1 line. In Animated he was a sensei to Prowl, but he still maintained that cool attitude of his that is his is calling card. 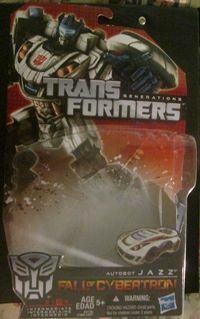 He is one of the few Transformers who you might change the skin, but the attitude, or the desire for music doesn't die. Right off the box here, "Autobot Jazz is gifted for a flair for improvisation. Optimus Prime entrusts him with the most sensitive of missions, counting on his keen mind to accomplish the most dangerous objectives"
The Generations series covers two video games, and two books, so we've got a good idea of what this Jazz is all about. When the Transformers are one unified race, he's a "cultural investigator", in simpler terms a sociologist, and to take it down one more level. He investigates how societies work. In more than a few ways being the cool cat fits the needs of someone who's going to go digging into how a society work, since only the most wound up, up tight bots won't spare a moment for someone as chill as Jazz. In the books he's a firm supporter of Prime, in some ways the first one to believe in his social movement that will be called Autobots. He helps a data clerk take the clues from a developing despot, and leading it towards democracy and freedom. In the first game, he's a prisoner. How he ended up there, you don't know. How he breaks out you do know. In the second game, he's actually playable, and he does play a vital role. The lines and the actions do fit the profile of what the Jazz we all know and love. Robot Mode:In some ways the more bots change, the more they stay the same. Jazz hasn't changed all that much in 30 years. His head pops out of the car's hood, his feet come from the rear. However this is a call of Jazz of Generations series based on Transformers: Fall of Cybertron. Jazz suffers a lot of little flaws that diminish him as a Transformer. He seems to be light in the physical kind of plastic used to produce him, and he has open spaces where before they would be closed. Where in the game there are colors, they are lacking in the action figure, or appear in a lower level of brightness. You can't mistake him for another Transformer, but the fact is that with minimal costs a better Jazz of this size class could've been produced. We all know that sometimes you just can't make what happens in a game real, and you need to comprise on the design. In the game Jazz has wheels in his ankles, trying to design a Transformer where you could put functional wheels in the ankles would be difficult. Jazz has fake wheels here, while due to his transformation his "spare" real wheels are hidden in his chest. From the legs to his hips he looks game accurate and great. His chest is by far the widest part of his body and in a few ways seems to swallow his head up. The chest is where you will notice those empty spaces I noted before. They did do a good job of hiding the wheels in his chest with the way his arms attach to his body. His arms do look game accurate, the wheels are where they are suppose to be. I find that they are above average in the positions they can hold, and he's one of the few Transformers of this size class that can hold his weapon above his head without tipping over. It's almost a crying shame on the opportunity the designers missed on Jazz. They could've put a nice hole on his back where his pistol can be stored near the small of his back. However, due the way that his elbows bend, he can't reach back there to grab the gun and pull it out like a cybertronic cowboy. Yes, Jazz has his cons (and not the kind he wants to shoot up) when coming to how he can pose. He also has his pros. Thanks in part to his feet's wide range of motion, and the teeth like gears used to hold them in place; he can do the splits like an Olympic athlete. He does have 18 points of articulation, but more than a few poses are hard for him to hold. Vehicle mode:Now let's get to transforming Jazz from a robot to a race car from Cybertron. You'll straighten out his back which bends into an upper and lower back. Join his legs together vie peg/hole combination just below his knees. If you haven't removed his gun by now, well now's the time, since his arms go up, and make it look like he's about to take a backwards dive into a pool, after rotating his arms 180 degrees. You're going to pull his chest up like a fish on the line, his legs will automatically fold under him, so time to rotate his feet 90 degrees so the soles are parallel to the backs his legs. When you move his hands towards the rear of the car to close it all up there are several tabs that help lock it all up. I will note the one connecting the lower to the upper arm is very fragile, and tends to break under minimal stress. What we now have is a race car from Cybertron. Don't ask me why Jazz as a mild manner sociologist turns into a race car, maybe he likes to do his job with a flair? It's part of the tradition of being Jazz, if you are going to travel, travel in style. Does he look game accurate? Yes he does, he looks like he just drove out of Iacon, minus the flashy colours we see in the game. Now this cute little pistol he has fits above what is his windshield, and the barrel seems to go over the entire windshield. It just seems like a bad place to have a gun. Don't get me wrong; remember that golden design opportunity I mentioned earlier? Well, if this hole was in the back instead on top of the windshield it would make more sense. As a vehicle Jazz definitely doesn't suffer the "flip me over, and see me out" syndrome other Transformers suffer. The way the legs, and the hands work it with some fake parts screwed in, it creates the illusion of a complex Transformer. Those fake wheels I mentioned earlier easily blend into the rest of his design. His backside is a bit weak with no real physical closure to hide his hands, but it's not as obvious as on other Transformers. 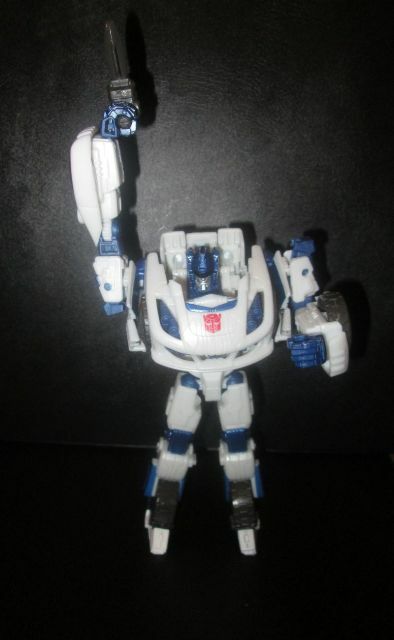 Transformation 5/10: Hasbro says Jazz is an intermediate level Transformer for difficulty, and they are right. I agree he's not super hard or easy to Transform. The way he transforms reminds me way too much of Animated Jazz to merit much in the originally part of how he transformers. Durability 2/10: He's got small plastic parts that are easy to break off, he's made of a cheaper grade of plastic that other Transformers. I could see a 10 year old destroying Jazz inside a month of fighting the Decepticons beyond a parents ability to fix. I've even seen this Jazz broken in the box on sale at retailers. 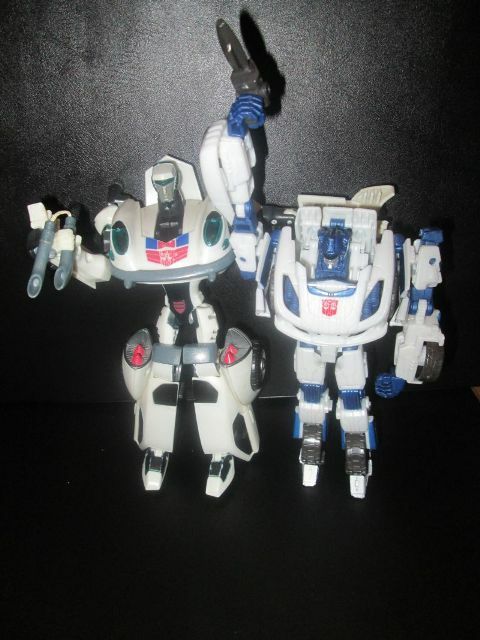 Fun 8/10: Yeah Jazz is a fun bot to have in any collection. He can take pose's that other Transformers can only dream to hold. Partly because of his design, and partly because of his smaller than average weapon which reminds me of the combiner part weapons truth be told. When he's in vehicle mode he looks so sharp that you can't help but think he's going to get going to go where he's needed at any given moment. Price 7/10: I got Jazz for about $10. It was a going out of business sale for a major retailer where I live, so you know how prices go on that. At $10 he's a fair price, but because of the durability problems I note, anything above that for a child is a rip off. I can see an adult breaking Jazz unintentionally so if he's over $20, time to put him down. Final Score 6/10: Jazz has a lot of great qualities, he's nearly accurate to the game he's based on. He's fun to play with. Great range of positions he can take. Yes, he's a bit smaller than other Transformers in his size class, and he's got a lot of unfulfilled potential. If you see him on sale, I would say grab him. If its a parent buying him as a toy for a child. I am sorry Jazz, maybe next time, because you are too delicate.